The AmD with AutoAid/RCIB Insurance Racing team will seek to end a solid season on a high this weekend when the 2018 Dunlop MSA British Touring Car Championship campaign draws to a close. 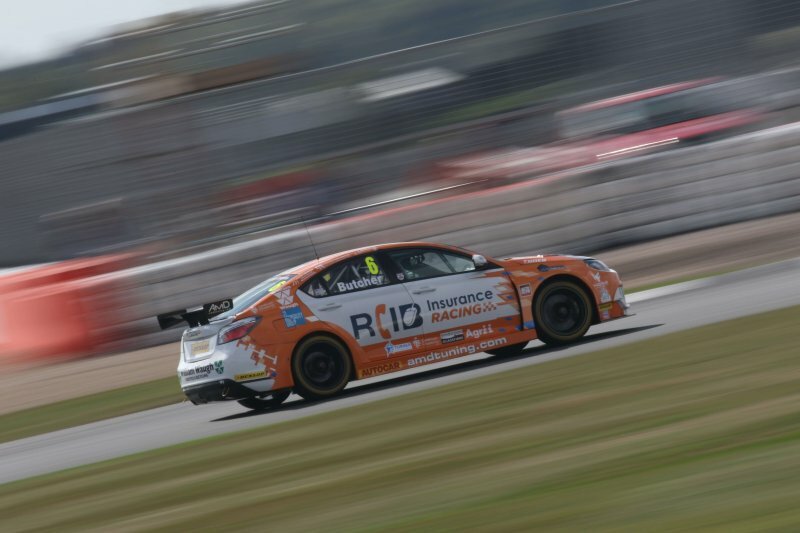 The West Thurrock-based outfit makes the short trip to Brands Hatch hoping to maintain the kind of form that has seen its MG6 GT regularly in contention for points scoring finishes. Fife racer Rory Butcher has proven to be one of the stars of the season in his first full year in the series, and heads to Brands Hatch keen to add to the 17 points scoring finishes he has enjoyed thus far. The 31-year-old picked up three top 15 finishes on the shorter Indy layout at Brands Hatch at the start of the year and has continually punched above his weight throughout the campaign with a series of impressive performances on track. Rory goes into the weekend needing to score a single point to become the first AmD driver to score a century in a season, whilst he will also seek to wrap up a top ten finish in the Independents’ Trophy standings. A second place finish in the Jack Sears Trophy, for drivers who have yet to finish on the overall podium, is also still possible, with Rory adopting the same race-by-race approach he has taken all season with his focus on trying to make it 20 points finishes for the campaign. Yorkshire team-mate Josh Caygill will be making his second appearance in the sister MG having made his debut with the team at Silverstone two weeks ago. Although overheating issues prevented him from picking up three finishes on his first weekend in the car, Josh made solid progress on track as he returned to front-wheel drive competition and will aim to maintain that progress to push forwards towards the top 20. Unlike at Silverstone, Josh will go into the weekend without any additional success ballast onboard his car; something that will boost his chances of some strong results on a circuit where he has already won this season in the Blancpain Sprint Cup. Off track, this weekend will see the conclusion of the special competition that has run throughout the season giving one lucky person the chance to win a road-going replica of the MG6 GT that has raced on track throughout the year. Eight competition winners have already earned their place in the grand final this weekend at Brands Hatch, with two more people having the chance to join them in the battle to secure the car. Those two will be selected from all those who purchase AmD with AutoAid/RCIB Insurance Racing merchandise at the circuit, and which is available for sale across the weekend in the trade area. A head-to-head Scalextric battle will then determine which of the ten comes away with the top prize. “The Brands Hatch GP circuit is a great place to end the season. It’s a circuit I really enjoy and one where I feel the MG should go well as we have performed strongly at venues featuring quick corners – which is what we’ll face this weekend. We also made a lot of progress with the set-up of the car at Silverstone last time out and I feel that will put us in a good position going into the season finale. “I have a number of aims for this weekend. I want to break the 100 point mark for the season, try to secure a place in the top 15 in the overall championship and cement a top three finish in the Jack Sears Trophy. “I can’t wait to get back in the car this weekend. Silverstone was a learning weekend for me and a very public test, and I was happy with the improvement I made even if we had a few issues that affected the results. I’m eager to try and kick on now at Brands Hatch and try to push for some solid results. “With the knowledge and experience I have from some time in the car, I’m hoping that I can be on the pace from the start of the weekend and will be able to hit the ground running, whilst it will also benefit me to not be carrying additional weight this weekend. To be honest, I was shocked by the impact the weight had at Silverstone and the car was transformed when we took it out, so I know I’ll be starting in a better place. “I think we’ve done a good job with the MGs this season and go into the finale at Brands Hatch feeling optimistic about ending the year on a high. “Rory has done a fantastic job in his first full season in the series and has done everything we hoped he would do, and more besides. Given the pace he has shown in recent events, we’re confident that he can bring home a top ten finish to end the year strongly and cement his position in the standings.